Back in September, nearly 10 months ago, Skimlinks co-founder Joe Stepniewski contacted me with an idea. For a while, they had been kicking around the thought of releasing a whitepaper or ebook about forum monetization. They wanted it to be valuable and they wanted me to write it. One of the most interesting parts of Joe’s message? They wanted their one and only competitor to be mentioned right alongside them in the work. That caught my attention. I was interested, but we had to work out some details. For it to be truly valuable, we agreed that it had to be independent and unbiased. I have a good, long term relationship with Skimlinks, Joe and co-founder and CEO Alicia Navarro and I think they are great, ethical people with a great product. But, at the same time, them sponsoring the book creates an appearance of bias. It can’t be argued. So, how do we mitigate that? In the end, they agreed to something that I feel a lot of companies would balk at: to give me complete, unquestioned editorial control of the work. What does “complete, unquestioned editorial control” mean? Here’s what we agreed on: once I have been paid, I will go away and write. I won’t show them the full work until it is completed. Once I give it to them, they can’t change anything and it has to be released as is. Outside of the foreword, I have the final say on every single word and who is allowed to write those words. That is exactly what happened. That they agreed to that shows that they had a strong belief in me, which I really appreciate it. They wanted the book to be written by someone who was passionate about community, to ensure the book balanced the need to generate revenue with the desire to maintain a good member experience on your forums. Once those parameters were set, the work grew into something very special, blowing past any and all estimates we had for it. Originally, it was supposed to be around 30 pages, released in 2011. The finished work is 96 pages and was in development for 9 months. It will also be available for free. That wasn’t always a given because of how we approached this project. We discussed charging for it, so that people would actually place a value on it. There are so many free ebooks out there and the truth is, most of them are marketing gimmicks. But, I’ve never written a free ebook or white paper before. I don’t do this everyday. For me to do it, I wanted to look at it in a similar manner to how I looked at “Managing Online Forums.” Which is to say that I wanted to treat it like a book for a major publisher. That’s why it isn’t 30 pages. That’s why we didn’t put it out last year. It grew to be bigger and more meaningful and we adjusted our timelines. I wrote most of it, with contributions from Alicia, Ted Sindzinski of Modern Insider and Todd Garland, CEO of BuySellAds.com. Alicia, Ted and Todd were hand selected by me to contribute to areas where I felt their extensive knowledge would add value in ways that mine could not. They were not allowed to contribute out of favor or requirement. In fact, both Ted and Todd were compensated for their work as writers. That is the level of care we put into it. We had an editor lend a second set of eyes to my writing and tighten it up. Skimlinks designer Barbara Somlai designed a tremendously artistic, visually impressive cover. And it was indexed. That’s right, a free book that was indexed by a professional book indexer. I suggested it and Skimlinks was gracious enough to see the value and pay for it. The traditional route with free ebooks is that it is a list generation game. They take your name and email address and you get a copy. Then they can email you in the future, until you unsubscribe from their list (which many – most? – do). With the money and staff time that Skimlinks has invested in this, I want them to get their value, just like I wanted AMACOM to get their value out of publishing “Managing Online Forums.” I wouldn’t have faulted them if they wanted to collect information. Crazy as it may sound to many marketers, Skimlinks decided to totally forgo that and simply give people the book for free, with no strings attached. That’s remarkable to me. They believe that if this is a quality work that is well received, simply being associated with it and the resulting buzz, press and attention, will reap the same or bigger benefits of a marketing campaign of the same cost. I think that is a big step and something people should give them credit for. As you can probably tell from this story, I am very excited to announce “Monetizing Online Forums,” which we will be releasing on July 2 through a dedicated website. Forums take a lot of work. To run one well can turn into a full time job. But, at the same time, forums can be more sensitive to monetization than other spaces. This book is not about squeezing every last dime out of your forums, but making money in the right way with the right methods. Over monetization can kill a forum – with this guide, I want to help people monetize appropriately, ensuring the long-term stability of their forums. This is why it means something to me. We cover every meaningful form of monetization, including display advertising, in-text monetization, classified and thread based advertising, sponsored brand placement, affiliate programs and CPA networks, product sales, premium memberships, mobile and monetizing your presence on other social sites. We talk not only about what, but how to work with these methods in an ethical way that respects your community. I hope that it helps people and that you find value in it. If you can do anything to spread the word about it, I would greatly appreciate it. Please feel free to contact me if you have any questions. Thank you for reading and for your support. 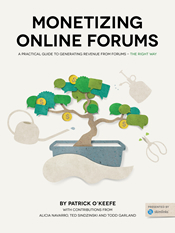 Monetizing Online Forums is One Year Old! Thank you for your interest, Mr. Fiske. I look forward to hearing your thoughts.